Image Audio IA8 review | What Hi-Fi? Image Audio makes nothing but on-wall speakers. The IA8s are the company's flagship, and are significantly wider and heavier than the Monitor Audio SoundFrame 1s. That's reflected in their presentation – placed on the wall on their secure wall-mounts, the Image Audios are prodigious, with all the scale of a large pair of stand-mounted speakers. With the boisterous Inception soundtrack, the IA8s thunder through the lows, sweep through the broadest dynamics and create a huge soundstage, wherever you sit or stand. The substantial 20cm mid/bass drive units underpin that ability, as do the ports. of-diameter) ports that run from each side of the drive unit down towards the speakers' base, exiting from discreet holes at the bottom of the cabinet. 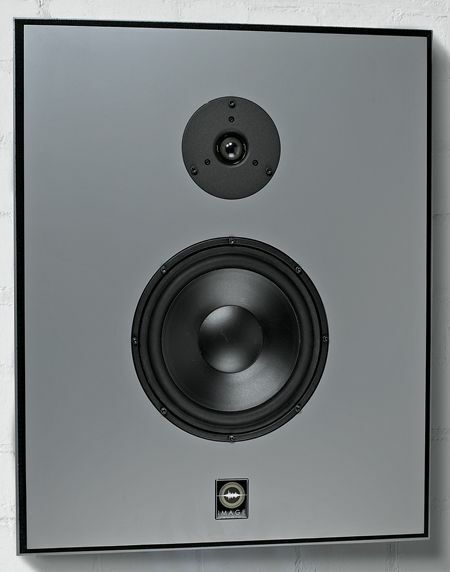 dome tweeters and crossovers freighting the sound with an analytical and almost aloof character. Instrumental strands are easily deciphered, voices have the requisite presence and soundstaging is strong - but by the same token, there seems a slight lack of excitement to the presentation. In that sense, the Image Audios seem a solid reflection of their designer's preferences and pro-monitor, studio-based background: they're commendably precise, but at times, sound a little detached next to the similarly expensive PMC Wafer 2. If there's another criticism, it centres on the finish, which is decent, but doesn't seem as luxurious as you'd hope for given the price (although build quality is fine). Chase your cables into the wall and you'll obviate the problem – but then that rather detracts from the simplicity of using on-wall rather than in-wall speakers. On the other hand, at least the grille prices seem very reasonable: you can select the grilles of your choice from its library of images as part of the purchase price, while optional grilles cost a modest £50 (per pair) extra. Overall, the Image Audio IA8 offer a great deal to admire.